Back on tax day in April, Bloomberg.com ran a good story on the tax tricks the rich can use to reduce, defer or avoid altogether federal income taxation. Jesse Drucker, How to Pay No Taxes: Ten Strategies Used by the Rich, Bloomberg.com (Apr. 17, 2012). As Drucker notes, the very very wealthy at the top of the income distribution have made out extraordinarily well in the last decade as to amount of taxes paid. They don’t even necessarily have to cheat to do it. They just use the tried and true tax reduction methods built into the system for their benefit–like “monetizing” their wealth through borrowings that they don’t pay back in their lifetimes, but are paid out of the estate (which can sell stocks with the step up in basis resulting in no taxes). That’s because those figures fail to include the additional income that’s generated by many sophisticated tax-avoidance strategies. Several of those techniques involve some variation of complicated borrowings that never get repaid, netting the beneficiaries hundreds of millions in tax-free cash. The article lists ten common ways the rich avoid taxes. 10. the venti (having a chunk of your big CEO compensation paid through a deferred compensation plan where earnings grow tax-deferred for years or decades). What’s the moral of this tale? That Congress could easily stop every one of these tax avoidance schemes if it wanted to. And it should want to, so that the ultra-rich don’t continue to have access to schemes that allow them to avoid taxation that are simply not available to ordinary people. I want to pass this forum and debate along at Policymic to readers. There are a number of excellent people in the comments section as well. Both have written 500-word articles and are now battling each other (along with others) via the debate stream. Seems like everybody these days is into misrepresenting, distorting, or at least stretching the facts to suit the spin they want to give. One issue that I raised in my snarky post on the 15th about the Budget commentary was the way most media has described the December 2010 Tax Relief ….and Job Creation Act. As you will recall, that bill extended the Bush tax cuts for another two years, and most of the media talks about it as a “tax cut” bill. But in fact that bill ended the “Making Work Pay” provision, a cornerstone of the Obama Administration’s attempt to make the stimulus package work for ordinary Americans. The end of that provision resulted in a substantial tax increase for 51 million Americans in the lower income distribution. See, e.g., Floyd Norris, Some Taxes Went Up (Feb. 4, 2011); Tax Policy Center, Table on the 2010 tax bill (Dec. 13, 2010). When we talk about that bill, wouldn’t it be more accurate to discuss it as a tax bill that increased the burden on some of those in the most unfortunate circumstances, while giving substantial tax cuts to those at the top? FactCheck.org, of course, spends its time looking for just those kinds of distorting statements and trying to set the record straight so that we are all talking about the same set of facts. They did an analysis of the “Budget Spin” that both sides put out surrounding the release of the President’s Budget. Both sides get very bad grades. Both sides misrepresent facts–neither Democrat nor Republican is immune. And those misstated facts spread like wildfire over the net, as illustrated by Sarah Palin’s “mis-tweet” claiming that the White House is proposing a mere $775 million in cuts amounting to less than 1/10th of 1% of the deficit and linking to Glenn Beck’s right-wing website as proof. The truth is quite different–$33 billion in discretionary cuts for 2012, and the website link from which she got her information was a mischaracterization of some examples offered by White House Budget Director Lew that was posted 5 days before the budget release. But Palin’s “mis-tweet” has been “re-tweeted” and that is the way misleading information is spread so easily on the net. Reposted from New Deal 2.0 with permission from author. Economist James K. Galbraith attends a Pete Peterson-funded road show. The Fiscal Solutions Tour is the latest Peter G. Peterson Foundation effort to rouse the public against deficits and the national debt — and in particular (though they manage to avoid saying so) to win support for measures that would impose drastic cuts on Social Security and Medicare. It features Robert Bixby of the Concord Coalition, former Comptroller General David Walker and the veteran economist Alice Rivlin, whose recent distinctions include serving on the Bowles-Simpson commission. They came to Austin on February 9 and (partly because Rivlin is an old friend) I went. Mr. Bixby began by describing the public debt as “the defining issue of our time.” It is, he said, a question of “how big a debt we can have and what can we afford?” He did not explain why this is so. He did not, for instance, attempt to compare the debt to the financial crisis, to joblessness or foreclosures, nor to energy or climate change. Oddly none of those issues were actually mentioned by anyone, all evening long. A notable feature of Bixby’s presentation were his charts. One of them showed clearly how the public deficit soared at the precise moment that the financial crisis struck in late 2008. The chart also shows how the Clinton surpluses had started to disappear in the recession of 2000. But Mr. Bixby seemed not to have noticed either event. 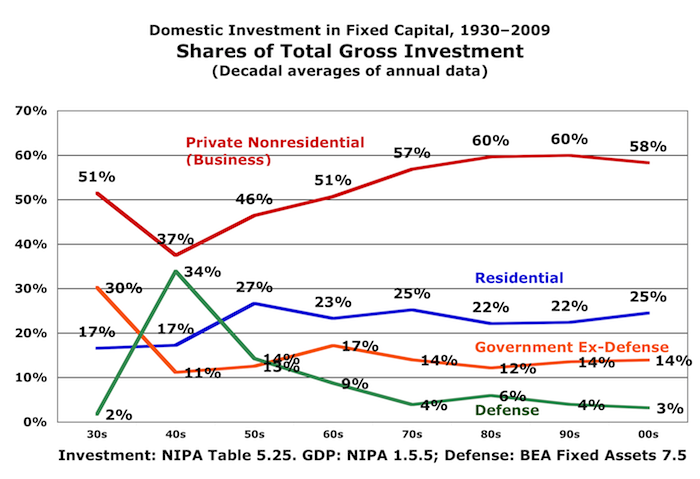 Flashing this chart, he merely commented that “Congress took care” of the budget surplus. Still, the charts did show the facts — and in this respect they were the intellectual highpoint of the occasion. To my surprise, Walker began on a disarming note: he acknowledged that the level of our national debt is not actually high. In relation to GDP, it is only a bit over half of what it was in 1946. And to give more credit, the number Walker used, 63 percent, refers to debt held by the public, which is the correct construct — not the 90+ percent figure for gross debt, commonly seen in press reports and in comparisons with other countries. The relevant number is today below where it was in the mid-1950s, and comparable to the early 1990s. But Mr. Walker countered that fact with another, which I’d never heard mentioned before: in real terms he said — that is, after adjusting for inflation — per capita national debt is now twice what it was back then. The problem is that real per capita national debt is a concept with no economic meaning or importance. (No government agency reports it, either.) Even in the private sector, debt levels matter only in relation to income and wealth: richer people can (and do) take on more debt. Real per capita national income is well over three times higher today than it was in 1946 — so how could it possibly matter that the “real per capita national debt” is twice as high? Next, Mr. Walker made a comparison between the United States and Greece, with the implication being that this country might, some day soon, face that country’s interest costs. But of course this is nonsense. Greece is a small nation that has to borrow in a currency it cannot control. The United States is a large nation that pays up in a money it can print. There is no chance the markets will mistake the US for Greece, and of course they have not done so. Finally, Mr. Walker warned that “foreign lenders… can’t dump their debt but can curb their appetite” for new US Treasury bonds. This was an oblique reference to the yellow peril. The idea, when you think about it, is that the Chinese central bank will acquire dollars — which it does when China runs an export surplus — and then fail to convert them into Treasury bonds, thereby choosing, voluntarily, to hold dollars in cash, which earns no interest, instead of as Treasury bills, which do. Mr. Walker did not try to explain why this would appeal to the Chinese. Walker closed by calling for action tied to an increase in the debt ceiling; specifically for a hard cap on the debt-to-GDP ratio with “enforcement mechanisms,” which could include pro rata cuts in Social Security and Medicare benefits and tax surcharges. He did not specify whether the cap should apply to gross federal debt or only to that part of the debt held by the public (a number which the Federal Reserve can change, any time it wants, by buying or selling public debt). When pressed, in the question period, he would not even say what he thought the cap should be. I waited for Ms. Rivlin to add something sensible. But she did not. Apart from some platitudes — she favors “serious tax reform” and “restructuring Medicare” — her interesting contribution was to restate Mr. Walker’s comment about “foreign lenders,” who might say “we’re not going to lend you any more money.” That this would amount to saying “we’re not going to sell you any more goods” seems — from a question-and-answer and brief exchange afterward — genuinely not to have crossed her mind. The Fiscal Solutions Tour comes with a nice brochure, and even (in my case) with a flash drive containing Mr. Bixby’s powerpoints. But does Mr. Peterson think he’s getting his money’s worth? The President, in his State of the Union, mostly ignored him. The Bowles-Simpson effort (which he paid for in part) and the closely allied Rivlin-Domenici plan are fading from view. And as the House Republicans forge their own course, demanding radical spending cuts right now — for political rather than economic reasons, which they don’t even bother to explain — the tired and shabby arguments of these old deficit-worriers hardly seem connected, any more, to the battles at hand. Maybe at this juncture, when Congress is beginning to talk about what to do about the sunsetting Bush tax provisions, it’s an appropriate time to remind ourselves about our historic commitment to progressivity in our tax system. A good source for thinking about this is an article by Tom Piketty and Emmanuel Saez, How Progressive is the U.S. Federal Tax System? A Historical and International Perspective, 21 J. Econ. Perspectives 3 (2007). What they show by looking at income and taxes over the period from 1960 to 2004 is revealing. While our system remains progressive to some extent, the progressivity has declined significantly. This is primarily, they say, because of the cuts in the corporate tax and the estate tax–taxes that impact the very wealthiest more than others because of their high ownership of financial assets. Our concept of distributive justice has always demanded that we should determine the tax burden based on individuals’ relative abilities to pay–that means that those with lots more should pay proportionately more of their income, since those with very little need all of their income just to meet daily needs, and those with considerable wealth won’t even notice whether they have another few dollars or not. The decades since Reagan took office have taken a huge toll on that sense of shared commitment. Fueled by a religious-like belief in the mathematically elegant but unrealistic assumptions of the “free market” economists from the Chicago School (see Yves Smith’s book, Econned, for a good take-down of the freshwater economists), the GOP in Congress passed huge tax cuts for the wealthy accompanied by increasingly heavy payroll taxes for others at the same time that spending continued apace–in fact, Reagan, Bush1 and Bush2 all greatly increased the military budgets and the Bushes embarked on wars of choice that imposed significant budgetary demands. The wealthy have fought for laws that favor them–deregulation, zero capital gains taxation, lower corporate taxes, the ability to offshore businesses and assets freely, privatization of social security and other programs (that would put more dollars under direct control of investment bankers and insurers), and lowering of individual tax rates and provisions that phased out deductions for the wealthy (like the phase out of the itemized deduction, which was repealed under Bush, etc.). There are some really great graphs in the article–so look at it rather than just reading these excerpts. But if you only have time for excerpts, here are some key ideas. many of the recent tax provisions that are currently hotly debated in Congress, such as whether there should be a permanent reduction in tax rates for capital gains and dividends, or whether the estate tax should be repealed, affect primarily the top percentile of the distribution—or even just an upper slice of the top percentile. This pattern strongly suggests that, in contrast to the standard political economy model, the progressivity of the current tax system is not being shaped by the self-interest of the median voter .12 Id. at 23. 12 Permanent reductions in dividend and capital gains combined with a repeal in the estate tax would certainly reduce the current progressivity of federal taxes and favor large wealth holders. The Alternative Mininum Tax, which is not indexed for inflation and hits more and more tax filers, will mostly increase tax burdens on the upper middle class but will not affect much the top 0.1 percent. The federal individual income tax is the largest tax, typically collecting 7–10 percent of GDP in most years since the 1960s. Individual income taxes declined sharply from 2000 to 2004 following the tax cuts of the Bush administration, falling from 10.3 percent of GDP in 2000 to 7.0 percent of GDP in 2004. The payroll tax financing Social Security and Medicare has increased significantly, climbing from about 2 percent of GDP in the 1960s to 6.4 percent of GDP by 2004. The corporate income tax has shrunk dramatically: it was typically 3.5– 4.0 percent of GDP in the 1960s, but had fallen to 1.6 percent of GDP by 2004. The estate and gift tax has always been very small relative to the other taxes, although it is important for distributional analysis because it disproportionately affects those with higher incomes. The estate tax collected about 0.6 percent of GDP in the 1960s, and 0.25 percent of GDP in 2004. The greater progressivity of federal taxes in 1960, in contrast to 2004, stems from the corporate income tax and the estate tax. The corporate tax collected about 6.5 percent of total personal income in 1960 and only around 2.5 percent of total income today. [emphasis added] Because capital income is very concentrated, it generated a substantial burden on top income groups. The estate tax has also decreased from 0.8 percent of total personal income in 1960 to about 0.35 percent of total income today. As a result, the burden of the estate tax relative to income has declined very sharply since 1960 in the top income groups.